Atrophic scars can be variously categorized depending on the reason: in therapeutic terms, atrophic scar varies from atrophy due to the lack of collagen in the dermis, as in the case of acne scars, to the lack of deep tissues under the adipose tissues due to trauma or surgery. 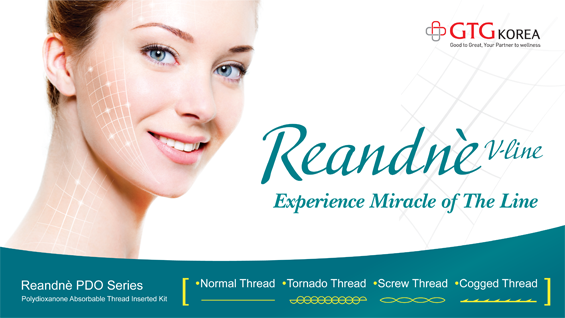 Less invasive laser, peeling and supplements are enough to provide good outcome when dermal defect is the main problem; however, invasive methods, such as fat grafting and surgical removal, are necessary when defects of the adipose tissues and others are accompanied. Acne scars are the most common condition among scar treatments in dermatology and plastic surgery. As acne scars present as various forms, it is very important to classify and treat them accordingly. 5) Deep dermal injury without epidermal injury: Focused Ultrasound Devices, Fractional Microneedle Radiofrequency Devices. Table 1. Goodman GJ,Baron JA, MDyPostacne Scarring: A Qualitative Global Scarring Grading System. DermatolSurg 2006:32:1458-1466. Table 2. 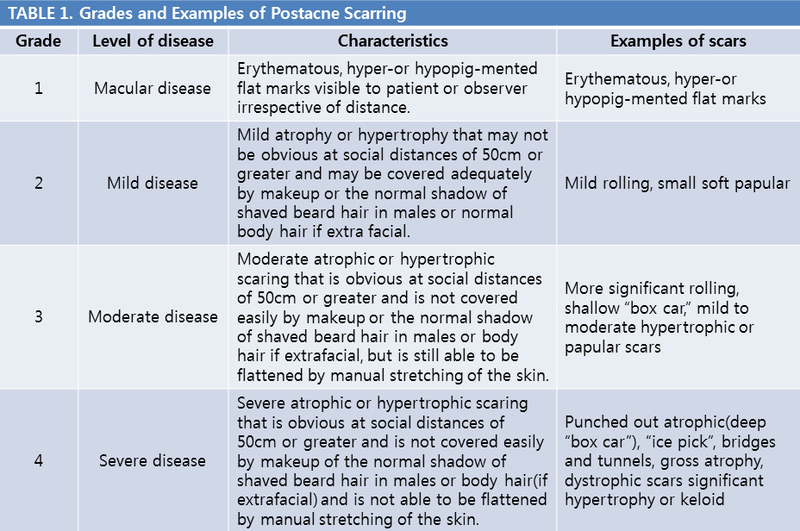 Goodman GJ,Baron JA, MDyPostacne Scarring: A Qualitative Global Scarring Grading System. DermatolSurg 2006:32:1458-1466. Temporary fillers using hyaluronic acid, calcium hydroxylapatite and collagen, as well as permanent fillers using polylactic acid, polyacrylamide and silicone, are commonly used. Recently, the method of correcting scars using autogenous cell has been developed. This so called ‘cell therapy’ attempts to introduce autogenous fibroblasts, adipose stem cells, adipocytes or preadipocytes. Hypertrophic scars or keloids are not easily treated and only one method is not enough to provide a good outcome. The most traditional method is surgical excision and steroid injection, but recently various new attempts and combination therapies have been introduced. Therapies introduced at Wound forumin 2004 are summarized below. Completely excised keloids tend to become bigger in size, but partial excision can reduce the size of a large lesion enough for injection therapy. Of course the surgical excision not the end of treatment; various other treatments should be combined to maintain the effect of the surgery. Recent studies reported that recurrence of a lesion can be prevented by post-operative application of imiquimod ointment (aldara). 1) Pulsed dye Laser is known to reduce TGF-beta and to prevent collagen synthesis of fibroblasts by acting on the blood vessels in the scar and making the scar to a hypoxic state. 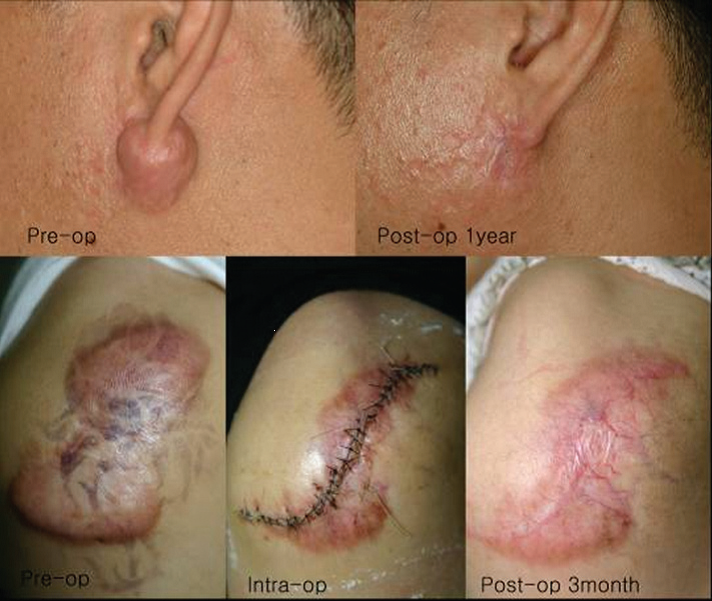 2) Fractional Laser has been reported recently to provide good outcomes as PDL in the treatment of keloid or hypertrophic scar. 1. Kelly AP. Medical and surgicaltherapies for keloids. Dermatol Ther2004;17:212-218. 2. Al-Attar A, Mess S, ThomassenJM, Kauffman CL, Davision SP. 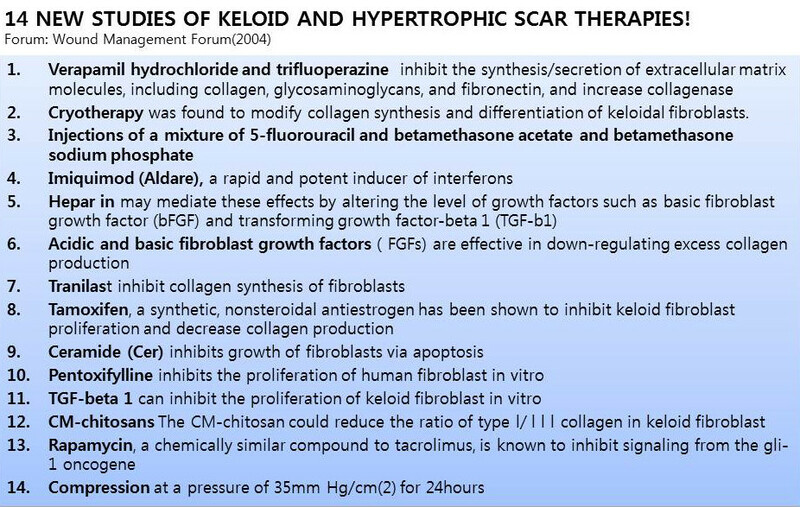 Keloid Pathogenesis and Treatment. Plast Reconst Surg 2006;117:286-300. 3. Mustoe TA, Cooter RD, Gold M, HobbsFDR, Ramelet AA, Shakespeare PG, et al. International clinical recommendations onscar management. Plast. Reconst Surg2002; 110: 560-571. 4. 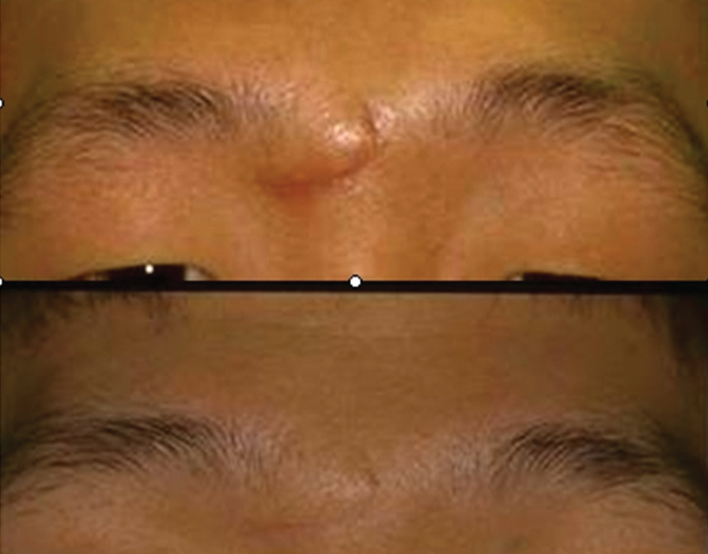 Connell PG, Harland C . Treatmentof keloid scars with pulsed dye lasers and intralesional steroid. J Cutan Laser Ther2000; 2:147-150 .